“I brought us fish!” exclaimed the Artist when he walked through the door early Sunday evening. We have been talking about eating more fish, and since he was going to be close to Uwajimaya he offered to pick some up. I was already thinking about salmon fillets that I would roast in parchment, with vegetables and lemon slices, to go along with the brown rice pilaf that was simmering on the stove. And then I opened the neat, sealed package to discover…a catfish! Right there, in front of my eyes lay a catfish, with the head attached, the gills, the tails – the whole fish! I have to give the Artist a few points for getting the fish gutted, at least. I have to admit, I am not a fan of catfish. The few times I have had it, the fish was dusted in cornmeal and fried, served with a side of remoulade. Frying was the last thing I wanted to do. And so, with a chef’s knife, I hacked off the head. Then, with a thin, flexible knife, I separated the fish into a single fillet and left the other side with the bone attached. And it was time to roast! 1. Preheat the oven to 400 degrees and line a baking sheet with parchment paper or foil. 2. 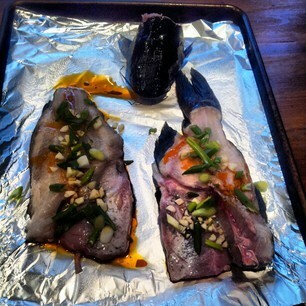 Arrange the fish fillets on the baking sheet and drizzle with oil, soy sauce, garlic and scallions. 4. Roast the fish in the oven for 12-15 minutes. 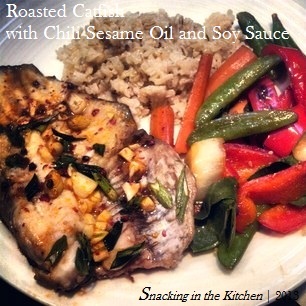 The fish finished roasting, the rice pilaf was fluffed, and the vegetables were quickly sauteed. When it came time to eat, I was hesitant. The end result was pleasantly surprising. The fish had a bright white flesh that looked strikingly gorgeous against the dark soy and the orange of the chili sesame oil. I’m not about to say that I’ll be running to the store tomorrow to pick up another catfish, but perhaps the next time I will be more open to trying something new. What’s your favorite way to eat catfish?